I get asked often if I saw the new Everest movie and my thoughts so I figured I’d write a review. In short I’ll say that it was done really well from a filming and experience perspective, especially in comparison to previous ‘cheesy’ climbing movies. I definitely recommend seeing Everest in 3D IMAX to get the full perspective of traveling up the mountain without actually doing it. Director Baltasar Kormakur and Cinematographer Salvatore Totino did a great job in providing a view of the mountain that most will never experience. My hope is that the majority of people leave with a new appreciation of Everest and those that attempt it, rather than more ammo of ridicule for someone’s lifetime goal that they’ll never understand. Additionally I hope it doesn’t give less-qualified weekend adventurers a false sense of encouragement to attempt the great peak. Unless, of course, they are willing to spend years to develop the training and experience needed. Nepal recently said they were going to put rules in place to prevent disabled, young / old and under qualified climbers from stepping foot beyond basecamp. Unfortunately it’ll be difficult to enforce the policy. Plus the real issue isn’t with the aged or disabled climbers it’s with the ‘few’ unqualified. In my experience it’s truly been a small group of people that don’t belong on the mountain, but for the most part the higher, more difficult peaks are scaled by true adventurers following their dreams. Typical media highlights the bad versus the good. It was difficult to sit through the movie Everest due to my personal experience there. In 2011 I ended up soloing the summit, which was short lived since on the descent, due to a goggle issue, I went completely snow-blind. Hand over hand I made my way down from the summit to high camp. I took a major fall and ran out of oxygen but after 7 hours, with pure determination and a miracle I made it back to the South Col. Sitting there in the theater with my wife, JoAnna, was very emotional to see what I traversed without vision. We didn’t bring our kids as it’s too close to home. They know what I went through but they are too young still to put a visual with the story. My personal rule is that if you’re not there then you truly don’t know, especially when it comes to the ‘death zone’. Many have depicted the ’96 tragedy but only a few were there. As far as the movie and whether it’s accurate based on the people involved and the discussions that occurred…only those that were there will ever know. Jon Krakauer had some issues with how his character was portrayed in the movie. He authored Into Thin Air after experiencing the tragedy. Many weren’t happy with how he portrayed the event and climbers. With anything media or Hollywood there are always altercations to entice the audience. He should know this better than anyone. Accurate or not, I can’t comment since I wasn’t there in 1996. The one critique I do have for the movie was that they didn’t focus on the time it takes to acclimate and climb. They briefly talked about it in the beginning when Rob Hall and crew were briefing the team. However throughout the movie they did a little climbing and then were quickly heading to the summit. To someone that doesn’t know about mountaineering they won’t get the magnitude of climbing the highest peak in the world. At 29,035′ there’s only 1/3 of the air that there is at sea-level. It takes 2 months to climb, with the first month focused on moving up and down the mountain to acclimate. This forces the body to produce more red blood cells, which carry more oxygen. 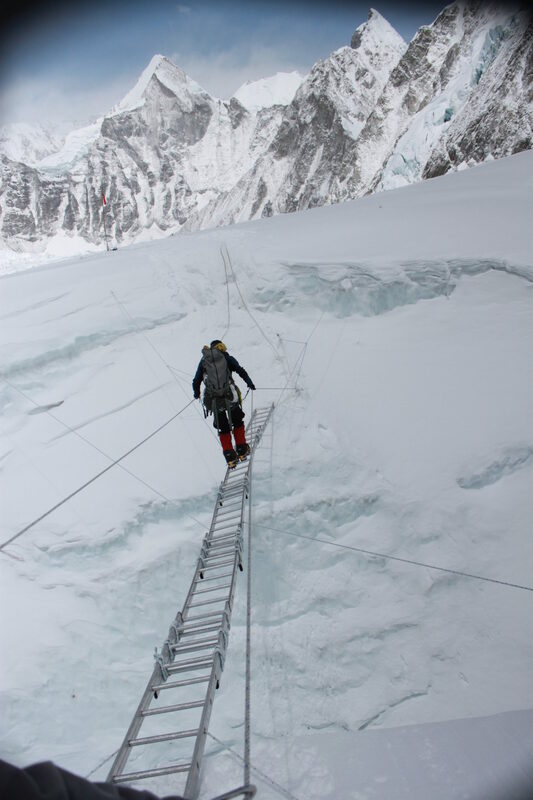 After reaching Camp III at 23,000′ the body is as acclimatized as it can be to climb to the summit. In the movie they could have easily put a timeline on the different scenes (ex. Day 1, Day 40, etc.). Small detail that could help educate the audience. I definitely recommend Everest as it’s the best mountaineering movie I’ve seen to date. We’ve come a long way in movie making with technology (CGI) and the need for quality over quantity. As emotional as it was to watch, I’m very impressed with the final product. If you have any questions feel free to ask through social media or my contact page.